Written by an authority involved in the field since its nascent stages, Diffuse Optical Tomography: Principles and Applications is a long-awaited profile of a revolutionary imaging method. Diffuse Optical Tomography (DOT) provides spatial distributions of intrinsic tissue optical properties or molecular contrast agents through model-based reconstruction algorithms using NIR measurements along or near the boundary of tissue. Despite the practical value of DOT, many engineers from electrical or applied mathematics backgrounds do not have a sufficient understanding of its vast clinical applications and portability value, or its uncommon advantages as a tool for obtaining functional, cellular, and molecular parameters. A collection of the author’s research and experience, this book fuses historical perspective and experiential anecdotes with fundamental principles and vital technical information needed to successfully apply this technology—particularly in medical imaging. 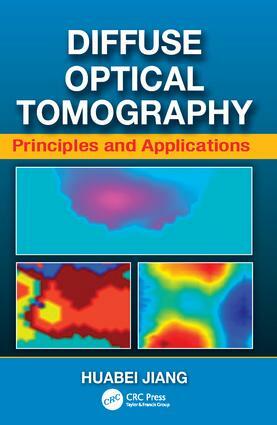 This book covers almost every aspect of DOT—including reconstruction algorithms based on nonlinear iterative Newton methods, instrumentation and calibration methods in both continuous-wave and frequency domains, and important issues of imaging contrast and spatial resolution. It also addresses phantom experiments and the development of various image-enhancing schemes, and it describes reconstruction methods based on contrast agents and fluorescence DOT. Offering a concise description of the particular problems involved in optical tomography, this reference illustrates DOT’s fundamental foundations and the principle of image reconstruction. It thoroughly explores computational methods, forward mathematical models, and inverse strategies, clearly illustrating solutions to key equations.